This geocache is part of the Taylor County Geotrail, a series of 11 geocaches launched in the Grafton area during Fall 2015. Since the 1930s, Tygart Lake has provided a source of recreation for North Central West Virginia. The West Virginia Division of Natural Resources manages the 391-acre Tygart Lake State Park near the dam to provide camping, hiking, and overnight lodging options. 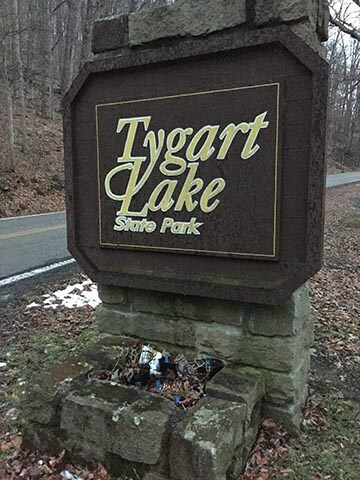 Tygart Lake State Park's amenities include 40 campsites, 11 cabins, the 20-room Tygart Lake Lodge, a sit-down restaurant, and miles of hiking trails. The park offices numerous programs throughout the year. Next to the park is Tygart Dam and its picnic area, which are managed by the U.S. Army Corps of Engineers. Tours of the dam are offered throughout the summer. This geocache is part of a series of 11 geocaches (see them all) in Taylor County. Find at least 10 to get a special Taylor County Geotrail wooden nickel! Fill out the codeword puzzle to receive your coin. One per household, please. This cache was placed with permission from the West Virginia Division of Natural Resources. Haqrearngu gbc ynaqvat bs fgnvepnfr.